The biggest political lie of 2016. 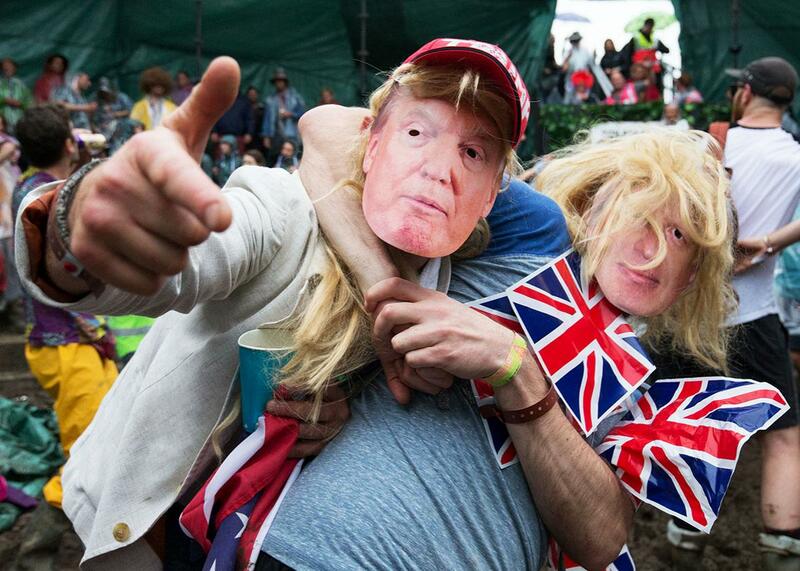 Participants wearing Donald Trump and Boris Johnson masks prepare for a tomato fight at the Glastonbury Festival 2016 on June 25 in England. We are in very dangerous times, of mobs and meaninglessness. People aren’t swayed by facts anymore; they’re indifferent to reality and openly scornful of experts. All they want is to feel good, even if it’s only for an instant, even if it’s at the cost of an entire future. Vast crowds of the pleasure-hungry are being pulled along into increasingly destructive politics by cheap sound bites and tawdry emotion. We’re teetering over the edge, and people hardly even notice—it’s all become theater; society rips itself apart in real time before our eyes, but we approach it like an entertainment product. The question is no longer one of which politician actually has the best judgment and the best plans for the future, but which character is the most relatable, which post we want to hitch our self-identity against. This is madness, but it’s also what’s come to rule our world. You’ve probably heard the name for all this. We are in post-truth politics. It’s not me saying this, though. This dire warning isn’t about Donald Trump, or Brexit, or the news media covering either, or the tiny reality bubbles of the internet. This is the oldest complaint in the history of political theory, screaming at us from the discipline’s frantic infancy. It’s Plato, writing in the 400s B.C. And he was wrong. Plato was also, incidentally, the first notable person to complain that music used to be good back in his day but that kids now will listen to any old junk. He whined in The Laws that talentless modern musicians, “being frenzied and unduly possessed by a spirit of pleasure, mix dirges with hymns and paeans with dithyrambs.” His complaints about the political culture of the time were in the same declensionist vein. Again in The Laws, Plato describes Athenian democracy as “wretched theatrokratia,” rule by the theater, a society on the precipice of tyranny. He famously wanted to expel the poets from his ideal Republic. Lyric poets, yes, but tragic dramatists especially. Today we’re comfortable with a few demarcated fictions; for Plato, who identified the true with the good and the good with the true, all the lies and illusions of theater, the men in masks pretending to be people they’re not, could only ever be dangerous. Stagecraft encourages mimesis. Audiences wince or laugh along with the hero’s adventures, and as they do so reality is upended. In Plato the visible is only a reflection of immutable concepts, with images a tertiary phenomenon—as he puts it, “naturally third from a king and the truth.” Reality rises from a dim underworld of representations to put both king and truth in danger. Plato’s prescription was for a rationally ordered society, governed by the philosophers—people who cared, before anything else, about the truth. These days, we call them technocrats. The current panic over the collapse of truth in politics, something ripped apart by the outrageous lies of Brexit on one side of the Atlantic and the rise of Donald Trump on the other, isn’t unjustified. These are dangerous ideologies, which have caused immense and terrifying damage in the past. But when you frame it as the disappearance of truth, you’re in murky territory. Still, this is what’s happening. In the Guardian, Jonathan Freedland cites a few of Trump’s well-publicized distortions as proof that we’ve been “left in a world without truth,” while editor Katharine Viner warns that, as a result of traditional media’s decline, “increasingly, what counts as a fact is merely a view that someone feels to be true.” The Washington Post concludes a wonkish roundup of opinion polls on public trust in experts and institutions by declaring our era one of “willful ignorance,” in which “the marshaling of undisputed facts and evidence doesn’t have quite the effect on public debate that it used to.” But what’s actually changed? At most, one form of lies is losing ground to another. In 2003, when we were told that half the world could be obliterated by Iraqi weapons within 45 minutes, were we still in pre-post-truth politics? At the start of this decade, when governments across Europe did everything to convince us that a global financial crisis had been caused by giving too much money to disabled people—was that also part of the lost golden age? When we entered the First World War to stop Belgian babies from being impaled on bayonets? When kings ruled by divine right? We have always been in post-truth politics. The first written texts of political theory are a lament that questions of government are no longer ruled by transcendent, objective fact. So many subsequent interventions tend to carry the same theme. John Stuart Mill and Alexis de Tocqueville warned darkly of the ignorant masses on the horizons, now terrifyingly sovereign. Kant saw humanity living deeply irrational lives in a state of self-imposed nonage, capable of being rescued only by an enlightened but autocratic ruler. Most revealingly, in his Reflections on the Revolution in France, Edmund Burke condemns radical and nonconformist preachers, who use their pulpits “not for the diffusion of truth, but for the spreading of contradiction.” Whenever political processes start to involve large numbers of people, there’s a worry that truth is being abandoned. This ought to say something. Science is a discourse in which the categories of truth or falsehood make sense; aesthetics is one in which they don’t. Politics is something strange, however: It’s far closer to literature than it is to science—disagreements over political principle can’t be settled through a practical experiment—but for nearly two and a half thousand years it’s faced the criticism that it should be something different from what it is. It might not be coincidental that this tends to happen when political reality has an opportunity to actually become something different. The liberal angst over Trump and Brexit is taken up again over socialists like Jeremy Corbyn or the movements that coalesced around Bernie Sanders: These people are fantasists and dreamers; their plans are flights of fancy, reckoned totally unworkable because they don’t maintain a currently existing truth. But the power offered by politics is always the power to imagine something unreal. You can dream of (for instance) a National Health Service, or an end to all war, or the liberation of women. You can dream of things that don’t yet exist and are by any binary definition untrue and then begin to bring them into being. Within politics you can say who you are and insist on it against those who’d rather you weren’t. Emotive judgments are important: We should be able to say that in a world with enough food for everyone it’s a moral outrage that people are still starving to death. Injustice demands anger—even if, by the cold calculus of pure facts, there’s no end of perfectly reasonable explanations for why the poor must suffer. Politics is where people can gain the ability to actively reshape the world, rather than just describe it. It’s as false as the Athenian theater, and this is no bad thing. Of course these aspects of politics can give rise to monsters like Donald Trump; dreams always raise the possibility of a nightmare. But when we’re confronted with political evil, our response should be to fight it with something good, not to grumble that it’s getting its statistics wrong. It’s not that facts aren’t good for anything, but a politics consisting of facts and nothing else isn’t politics, but management. This is what our politics are actually turning into: rule by experts and fatalism. There are hyperbolic versions: Neil deGrasse Tyson’s imagined country of “Rationalia,” for instance, where the primary constitutional principle is that all policy decisions are to be based on the collection of data and scientific standards of evidence, so that you’d have to run a trial on the arbitrary execution of dozens of innocent people before deciding that it’s a bad idea (or, a horrifying possibility, discovering that according to some emotionless utilitarian calculus it’s actually a good one). But stripped-back versions of Rationalia are all around us. In the United States, Hillary Clinton proudly boasts of her friendship with Henry Kissinger, who is indeed a very experienced statesman with a great many facts at his disposal, which all sounds wonderful as long as you don’t remember what he used those facts for. Until very recently, all the mainstream parties seemed to agree on a politics informed by plenty of data but that was making life worse for millions. Is it any wonder that people are trying to find a way out? When truth is all that matters, there’s no room for any vision of a better life. All you end up with is a system in which the rulers are the ones with the most information, who know the ins and outs of the machine, and are sporadically capable of keeping it running. And if it’s a machine for grinding up human bodies into a profitable paste, then that’s just the reality of things.